The Mission Society’s orphanage, church and school, built in a rather severe Gothic style 1862. It is now, of course, the popular Scoil Fhursa. Rev Dallas was a man of his time. He was virulently opposed to ‘the errors of Rome’ and actively sought to convert Catholics to the Protestant faith. He understood the value of using the Irish language when it was the vernacular of the children. The Society was careful to appoint teachers with a knowledge of Irish. At the time of the explosion a service was being conducted. It is believed that the intended target was the fireplace in the vestry, but a division in the chimney flue brought the bomb into the living quarters. Naturally there was a huge hue and cry. It came at an awkward time in the sensitivities of the people. The memories of hungry people who embraced the Protestant religion for food for themselves and their children in places where neither the Catholic church nor the Government provided any relief, were still raw. The Great Famine had officially ended 14 years before, but the endless trails of emigration, and the scars of starvation continued. There were people who resented the work of Irish Church Missions’ Society, the humiliation of the ‘Soupers’ or the ‘Jumpers’; and showed their anger in violence. There was an unseemly scramble for souls by both churches. However, the story of the explosion in the Mission Society’s living room was soon reported in the national press. But the local Galway papers took umbrage, and denied that any such malicious attack ever happened. The Vindicator proclaimed that such accusations were ‘a calumny’ against ‘the character of the locality’. When the Society offered a reward for information about the crime, The Vindicator scoffed at the idea of offering a reward ‘for the discovery of the perpetrator of an outrage that no one believes ever was committed’. There was even talk that explosive material was kept in the schoolhouse because ‘blasting operations’ had been carried out ‘on the premises lately’. The Galway Express claimed ‘that powder was hanging up in a bag in the schoolmaster’s kitchen’. Finally the fact that the injured boy had burned his hand was presented as proof that a youthful daredevil was the victim of his own foolishness ‘when putting powder into the fire’. That was accepted by the general public as the truth of the matter. The Mission Society did not come out well from the affair. Another curious incident at the Mission Society school was the report that it had taken in some of the Catholic children, many of whom were half starved as a result of the bitter Dublin ‘Lock Out’ of August 26 1913. Approximately 20,000 workers, many of whom lived in impoverished tenements, where infant mortality was among the highest in Europe, rallied to the call of James Larkin. The strike lasted more than four months, resisted by employers who simply locked out their staff, and let them starve. Police broke up mass pickets with batons, and dealt severely with prisoners. In a practical act of charity temporary foster homes were arranged for the children in Britain, and elsewhere, to ensure they at least they had some nourishment. The Archbishop of Dublin, Dr Walsh, however, denounced the scheme for putting the Catholic faith of the children at risk by sending them to a ‘pagan’ country. Vigilante committees patrolled the quays at Dublin and Dun Laoghaire. Imagine the surprise when it was reported that the Mission Society at Galway had sequestered a group of Catholic children of the Dublin strikers. The Connacht Tribune was on the case: ‘A considerable amount of sensation was caused in Galway during the weekend by the rumour that 15 children of the Dublin strikers had been secretly sent to Galway to be lodged at what is locally known a the ‘bird’s nest’. The report also gained credence that close upon a dozen children had been sent to a home in Clifden. Word of the children’s fate spread rapidly. Vigilant members of the Galway Ladies’ Auxiliary of the Ancient Order of Hibernians were speedily on the track of alleged proselytisers. Alas, there appears to have been no truth in the rumour. In a interview with the headmaster, Mr Bane, ‘he emphatically stated that there was not the smallest scintilla of foundation for the sensational rumours that had been going about.’ He did admit, however, that one child had been admitted in recent weeks. She was a ‘Protestant child’ - a native of a western county. There the matter rested. NOTES: It was colloquially known as ‘The Bird’s Nest’, as it was an orphanage of sorts, but also because it was located on a curious triangle of land surrounded by parts of Taylor’s Hill, St Mary’s Road and Sherwood Avenue. 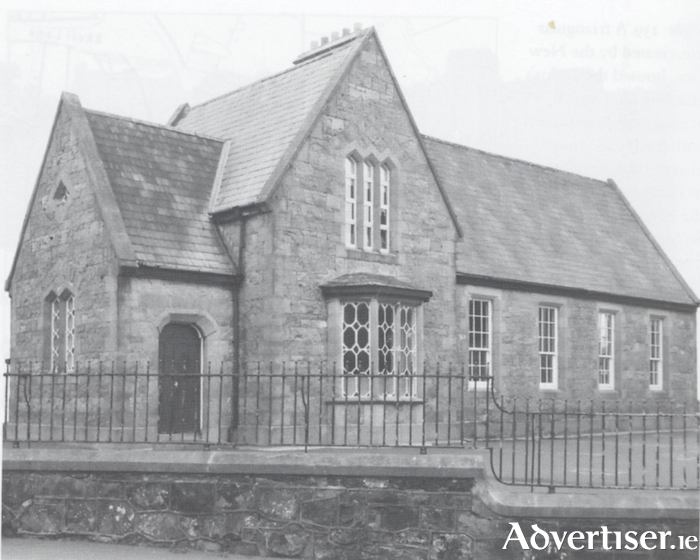 That small building, which thrives as a well known Irish national school to day, was certainly well used. A lot appears to be going on in that small building. The same Irish Church Missions Society operated a number of orphanages including one at Aasleagh, and Nead Na Farraige at Spiddal.